In a previous post, we saw how our greatest hindrance in worship, idolatry, is so prevalent in our society and in our own hearts. This post will be a discussion on how the way in which we worship in the Anglican Church helps weed out the common idols that most of us have. The reality is that we walk into worship every Sunday with many distractions we can't get rid of and many sins we love just too much. In our services on Sunday, we have some things "built-in" to the service every week that help take the Word of God and apply it to our distractions and sins like a medicine for our souls. Before we dive into this post, let me recommend two resources that will cover much of what I don't cover here. First is Mark Galli's article on how the liturgy is the most relevant way to worship out there today. 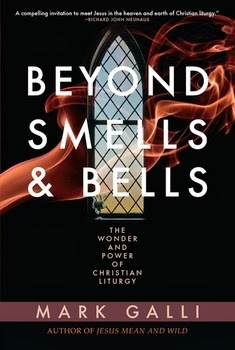 Mark's book Beyond Smells and Bells is a great introduction to the meaning of the liturgy for those who are curious, and I highly recommend his short little book (and steal from it frequently). Second, let me refer you to a sermon I preached a while back on worship and how God leads us into worship. The reality is that without God's help by his Holy Spirit, we can never rightly worship Him. That sermon brings out the need for cooperation with God in worship and the way God gives us strength when we can't seem to get our act together. - Priming the pump: The first we do in our service is gather sing to God. We are beginning with praise to God and "easing into" the full service of worship. Even just gathering into one place can remind us of who we are: the Church (which in Greek is the "ekklesia," roughly translated "called out ones") those who have been called out of other kingdoms into the Kingdom of God. The opening song we sing reminds us of the reality that God has called us to be his people so that we can worship him, and as we sing this first song, a big cross is carried up to the front of the church (called a processional cross) to remind us that the only reason we can gather here and be called God's people is because of Jesus Christ. All this makes us ready for the whole service. - Putting first things first: The service opens with a declaration: "Blessed be God, Father and Son and Holy Spirit! And blessed be his Kingdom now and forever!" Though we all want things be about us, the reality is that God is the most important Person. Until we realize that, nothing in life will make sense or work (Matt 6:33). And so, in order to reflect this truth, our service begins by declaring what is most important (most "blessed"): the Triune God and his Kingdom. In our desire to make an idol out of ourselves, this part of the liturgy sets us right. - Asking for help every week: The next thing we do in our service is ask for God's help! Since we are often very distracted and even still burdened by sins from the previous week, we begin our service with a prayer whose basic message is: "God, help us worship you! We are so messed up!" Here's that prayer: Almighty God, to you all hearts are open and to you all desires are known. Cleanse the thoughts of our hearts by the inspiration of your Holy Spirit, that we may perfectly love you, and worthily magnify your holy Name; through Christ our Lord. Amen. - Reading lots of Scripture: Wouldn't it be great if we could hear from God? Well, Christians believe the Bible is the primary way God speaks to us, and so, in our service, we read four passages of Scripture each week (Old Testament, Psalm, New Testament, & Gospel), getting through most of the Bible every three years. And though we have a serious sermon, we let the readings speak for themselves, often with the sermon only coming from one of the passages. We hear so many voices throughout the week which seek to tell us how to live and what is most important in life. I just makes sense to sit and listen to God's Word as much as we can to remind us of God's voice. - Robust preaching: It has been said that "sermonettes make Christianettes." And so, our service includes some serious and thoughtful teaching explaining the Bible and how it applies to our lives today. Even our preachers "sit under" the sermon, that is, we all need to submit to God's Word as it is preached... and this delivers us from being wise in our own eyes. - Making sure we cover the Important Stuff Every Week: So, what happens is the sermon is about marriage or family or money or how to run a good business? Well, in order to make sure we don't forget the most important and central truths of the Christian faith, we include them in every service. Every week we say the Nicene Creed. This Creed contains all the essential doctrines of the faith, and includes teachings that all Christians agree on. But not only do we say the Creed each week, but we take Communion each week, which (amongst other things) reminds us of the death and resurrection of Jesus, the very center of the gospel! - We actually pray in church: I know this sounds crazy, but we actually pray for things in church. We pray for our country, for the sick, the poor, those in prison. We pray for each other, for the world, for other churches. Lest we come to the service and think it is all about us "getting," we also give in offering up other people in prayer. - Confessing sin: Every person who goes to church is a sinner. And when we worship, we are worshipping a holy God, One who hates sin. Thankfully, God has promised to forgive us because Jesus paid the price for our sin with his death on the cross (1 John 1:9-2:2). Even so, our sins that we commit throughout the week hinder our relationship with God, and it is necessary for us to receive forgiveness each week (maybe even each day!). That is why we spend some time confessing our sins to God. Doesn't that just make sense? Coming to God without admitting I'm a sinner just seems hypocritical doesn't it? - Simply receiving... Sometime we get to Church and we are so tired that all we can do is receive. Other times we may be so confident in ourselves that we forget that everything we have we have been received. In our service we are reminded each week that God is the Giver, and we merely are the recipients of all his good gifts, including salvation through Jesus. And so, we come to the Lord's Table each week, taking Communion. The bread is placed in our hands and we are given a cup to drink from. This is just giving to us. Even if our minds are pulled in a thousand different directions and all we can do is just be there, we can receive God's grace. - Sending each week: One thing that Christians often do is make their worship service into an idol. In order to counteract this, we have a prayer at then end of every service that reminds us that we are not only a "called" people, but also a "sent" people. We are sent from our time together into the world to spread God's truth and love! These are just a FEW ways in which our liturgy helps us to worship God, helps to remove our idols in our hearts. I'm sure you can come up with more and leave them in the comments section!